Trying to focus on the face first since the body is way hard to do. Reference is from Alex Ross's painting (Dude who paints super heroes). Does anyone know of a book that shows photos of people walking with like a grid background to tell distances properly? IIRC It was pretty old. If not, does anyone know where I could find something of that sort... . Its for a math paper due tomorrow . Thanks dennis that really helped! I am glad, so a tiny part of the A+ you will get for that paper is mine! what do you all find to be the best approach to not just learning the anatomy but how to draw it in all kinds of poses and situations? Secondly, as a beginner, can anyone with good proficiency suggest how to begin? Do I emulate photos? Do I create my own pieces? When making my own, how can I develop an eye to see my own flaws, especially when to me it looks solid? First ever attempt at a skull today. I used the loomis method for the proportions of the head, but the chin doesn't seem low enough. The face looks like it needs to be longer to be realistic. It has a more cutesie feel, but I think I might actually like that. First anatomy post! Yay! Hopefully I can get into the swing of things and post one of these at least once a week. Comments and critique appreciated. As you noted, the face does indeed need to be longer in order to be proportionally accurate; the forehead especially (not only the jaw). One major problem is the connection you have drawn between the temporal and zygomatic, in reality there's a hole between the connection, which creates a tube-like bone on the side of the skull. New one. Brows are in a better spot now. 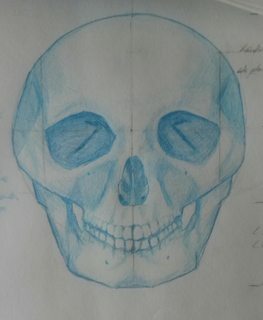 I tried to use a photo of a real skull instead of just images in my anatomy books, but I wasn't as focused today, so I just drew without looking at reference as much as I should have. The red lines above and below are where I feel like the skull should be at height wise. I'm not quite ready to give up on the Loomis proportions since it seems like they should work and because everyone considers the methods in his book to be great learning tools. I just don't know why it doesnt seem to work on my skull. Obviously your skull can't be longer than your head. Final notes for this- the Zygomatic process looks better, but maybe out to far, and the top sides of the cranium seem to angular or bumpy. Should the eye sockets be smaller?